The biggest news by far this month was that US Gold had merged with Ultimate Play The Game, and that US Gold would now handle all international manufacturing, promotion, marketing and sales of Ultimate games. Ultimate said that they were going to concentrate on making games and planned to release six new titles during 1986. What wasn't clear was just how involved the Stamper brothers were to be, but it would turn out that they already had their eyes on the new Japanese consoles and the formation of a certain company called Rare. Melbourne House announced they were busy on "Return of the Fist", the sequel to the excellent "Way of the Exploding Fist". The software company also had another sequel in the works: "Mugsy's Revenge", and the screenshots they teased looked rather good indeed. Martech were readying "The Planets", a game based on the TV documentary series of the same name. "Bounder" was to be the next game out from Gremlin. Steve Turner was finishing up his new game called "Ziggurat" (released as "Quazatron") which would be a bit like "Gyroscope" and feature "3D pyramids inhabited by robots and stuff." Elite's upcoming games were previewed, including "Bomb Jack", "Ghosts'n' Goblins" and the infamous "Scooby Doo in the Castle of Mystery". Regarding the latter, boss Steve Wilcox admitted it would be different from the version that had been heavily advertised, citing lack of RAM on the Speccy as the reason. "Movie" Imagine - Spectrum/Amstrad 10/10 Game of the Month "Movie is a brilliant game. It has atmosphere with a capital 'A'." 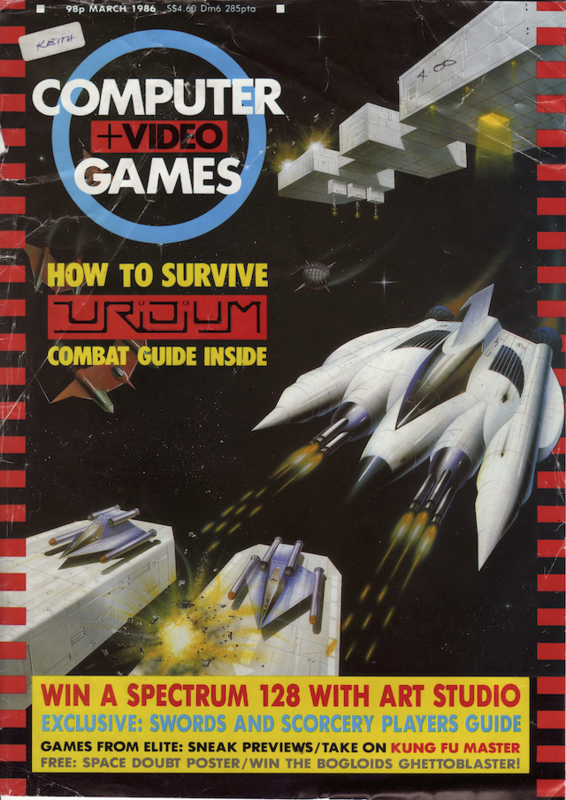 "Uridium" Andrew Braybrook/Hewson - C64 10/10 "Andrew Braybrook's Uridium is simply the best 64 game we've seen since Fist." This was the first game I ever bought for the C64 - even before I owned the machine itself! Many fond memories of playing it 'round mates places. "Back to Skool" Microsphere - Spectrum 8/10 "There's more to Back to Skool than meets the eye. If you were a fan of Skooldaze, you'll enjoy this follow-up." "Repton 2" Superior Software - BBC 10/10 "The graphics are smooth and very colourful, and the game as a whole is demanding and absorbing." "Space Doubt" CRL - C64 10/10 C&VG Hit "There's no doubt that Space Doubt will be a big hit." I bought this game based on this review and the development diary C&VG published... it was by no means worthy of a 10/10. "Rock'n Wrestle" Melbourne House - C64 9/10 C&VG Hit "Rock'n Wrestle is an exciting and original game. Not as instant as Fist - you'll need to be prepared to spend time learning a whole new way of using your joystick - but a game that will keep you in headlock for months." "Strangeloop" Virgin Games - Amstrad 9/10 C&VG Hit "If you got an Amstrad for Christmas then Strangeloop is the ideal game to rush out and buy with your Christmas cash. You won't want to play ANY other game for months!" "Battle of the Planets" Mikro-Gen - Spectrum 9/10 "Anyone who enjoys fast space shoot outs can't fail to like Mikro-Gen's first venture into arcade action - a mixture of Elite and 3D Tank Battle." This was originally intended to use Mikro-Gen's extra RAM pack that came with "Shadow of the Unicorn". "N.O.M.A.D." Ocean - Spectrum/Amstrad 9/10 C&VG Hit "Graphics are attractive, the sound is good and game play totally addictive. Rush out and find N.O.M.A.D. - before it finds you!" "Master of Magic" Richard Darling/Mastertronic - C64 9/10 C&VG Hit "Master of Magic is quite simply tremendous value and extremely addictive. Once you've entered Thelric's realm you won't really want to escape." "Lord of the Rings" Melbourne House - Spectrum 8/10 "Lord of the Rings is without doubt a far superior game to Hobbit and Sherlock. I would even go so far as saying that personally I believe this to be the best from Melbourne House so far!"